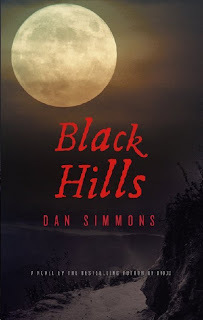 Black Hills, by Dan Simmons, begins with Paha Sapa, a young Lakota boy, touching the body of the dying General George Custer at Little Big Horn. In that moment, Custer's spirit enters Paha Sapa's body. It doesn't leave for over sixty years. Paha Sapa experiences this more than once with people. He has Custer's spirit in his head, but he also can see the pasts and futures of many people he meets, including Crazy Horse. During his initiation ceremony to become a man, Paha Sapa also experiences a terrible vision of the future; four large stone presidents of the United States careening across his beloved Black Hills, eating everything in their sight and leaving all behind them to waste. Paha Sapa grows up as his Lakota family and the other native tribes of the Great Plains die out. He comes to the decision that he must destroy these stone presidents before they destroy his land. So he sets out on a plan to blow up Mt. Rushmore before the monument is complete. I don't know how to review this book because my experience of it took me so far out of the story. Paha Sapa is a wonderful character; he is so good and so kind and so aware of his culture disintegrating around him. He is a complicated person who hates what the white settlers have done to his land but who also respects and admires their ingenuity and passion. He is one of the most achingly lonely characters I have met in a very long time. He is kind to everyone, but is set apart by his race and by the ghost in his mind and by other people's memories crowding out his own memories. I fell in love with him and his quiet dignity. I also enjoyed the story and Simmons' storytelling approach. There is a true sense of immediacy for the reader in each chapter. The narrative jumps around a lot, from the 1870s to the 1930s and between Paha Sapa and General Custer. One thing I found odd but eventually grew used to is that all dialogue is done in italics, with a dash in front. There is really never a "he said" in the whole book. This was confusing at first, especially when two characters were talking to each other, but eventually I got used to it. I also was initially confused by the jumping around in the dates, but eventually settled in. I think this book begs for a re-read so that I can appreciate all the subtleties in the writing when I go back, knowing the story's full arc. Native American history is conveniently swept under the rug in history class; no one wants to hear about how their exalted country decimated an entire population. When Native American history is taught, the tribes are often grouped together as one people, which is unfair. And they are given these almost mystical qualities of defending the planet against the ravages of greedy white people. It is just as unfair to set people up as idealistic and simple tree huggers who couldn't save the planet from Capitalism. Simmons doesn't play this card in his novel and I'm happy for it. There are moments of idealism in the book, yes (particularly the last thirty pages or so), but his characters also acknowledge that the tribes of the Great Plains were not perfect. They had petty feuds, senseless slaughter and numerous wars well before the whites arrived. Rather, Simmons shows us the emotional toll that westward expansion had on one Lakota man, and how his life was affected by it. It's a very intimate and highly moving portrait. While I think the ending of the book was very protracted, it certainly gave me a lot to think about with regards to the future. And I enjoyed getting a sense of General Custer, though the first few chapters from his point of view were far more erotically charged than I'd ever have expected from a man with such serious sideburns. But I must admit that while I enjoyed this book and appreciate Simmons' storytelling abilities, I much prefer it for opening my eyes to my own ignorance. I am grateful to Black Hills not for telling me a beautiful story but for making me see the void in my education where American history and the "Indian Wars" are concerned. I know nothing about General Custer but that he lost a huge battle. In my memory, that makes him a "loser" in a very vague sense of the word and completely negates his exemplary leadership skills in the Civil War. History also has a way of erasing personality. Custer comes alive in this book, and never moreso than when Paha Sapa comes face-to-face with the broken, deaf and disheartening 91-year-old Libby Custer, the love of Custer's life (and the subject of the erotically charged chapters I mention above). He says after Paha Sapa's encounter with her old, withered and crabby self, "You should have lived for yourself, Libbie Bacon, not for your dead husband. You should have celebrated life, not my death, and you should have become a lover again and awakened every day you could with another man's head on your pillow and your head on his." And so I greatly appreciate Simmons' novel for reminding me, gently, that a person should not be defined by one battle, or one moment, even though history makes it so easy to do so. Those larger-than-life statues of presidents, those monuments to war heroes and the blurbs in the history books obliterate the very real emotions and passions and beliefs of the people they strive to remember. And they often completely leave out the details of the people who were left behind, or killed, or decimated in quests for glory and land and gold. Black Hills is a good story, but I like the book because it reminded me that it is too easy to have a vague idea of history that can, quite frankly, be inaccurate. Or at the very least, only tell half the story. To celebrate the release of Black Hills, Hachette Book Group is giving away three copies of Dan Simmons' previous bestseller Drood to BookLust readers! The contest is open to residents of the US and Canada (no PO Boxes, please). To enter, just leave a comment with an email address and telling me what your favorite Victorian novel is. Entries accepted until 2/17. What a fabulous book. I love the sound of this story. I like the historical aspect of looking at Mount Rushmore before it was carved. I really like The Strange Case of Dr. Jekyll and Mr. Hyde by H.G. Wells. Also Sherlock Holmes is set in Victorian London. Weird coincidence - last night I read a poem by Sherman Alexie called 'Vilify' which features Mount Rushmore and Native American history. An interesting poem - a 5-stanza villanelle and 9 pages of notes following. Typical Alexie antics. As Victorian novels go, you can't do much better than A TALE OF TWO CITIES and GREAT EXPECTATIONS. I love them both. Thanks for an excellent review that added a title to my TBR! "I think this book begs for a re-read so that I can appreciate all the subtleties in the writing when I go back, knowing the story's full arc." This describes my favourite kind of reading experience, that which manages to satisfy on the first go and promises more on the second pass, so you're aware of the extra layers and their crafting even when you can't stop yourself from reading on because the story has such a strong pull. This sounds intriguing ... and I know quite a few people in my family who I think would like it. Great review. Love Robert Louis Stephenson's - Dr. Jekyll and Mr. Hyde as well. It's hard to pick a favorite Victorian novel... I really, really loved Collins' The Woman in White and really everything of his. Dickens' Bleak House and Pickwick Papers are two more top favorites. My email address is wisewoman (a) yahoo dot com. Thank you! If Sherlock Holmes counts I would definitely have to say The Adventures of Sherlock Holmes, with Great Expectations as a close second. Well, my favorite novel set in the Victorian period is "Jonathan Strange & Mr. Norrell" by Susannah Clarke, but my favorite novel by a Victorian author is probably "Dracula" by Bram Stoker. 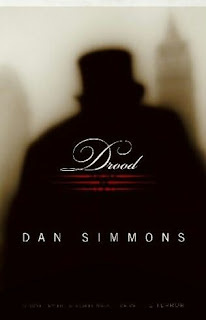 I would love to read DROOD by Dan Simmons. My favorite Victorian novel is THE OLD CURIOSITY SHOP BY CHARLES DICKENS. But a Victorian novel? Does Caleb Carr's Angel of Darkness count? Is that the right time period? This looks great! I love Charles Dickens - Great Expectations is my favorite. Thanks for the giveaway. I can't wait to read this novel - thanks for a great review! I always thought Simmons was most well-known for supernatural elements in otherwise very realistic books. Guess that's not the case here at all! My favorite Victorian novel is probably Bram Stoker's Dracula. Do I need to pick only one? I guess if I had to pick one, it would be Jane Eyre. My favorite victorian novel is Jane Eyre. My favorite Victorian novel? I really have no idea, but I do love Wuthering Heights, the Hound of the Baskervilles and Dracula, which other people mentioned. I'd love to read this. I don't think I have a favorite Victorian novel. Maybe it will be Drood! Thanks for the giveaway! Please count me in. Thanks for the chance. My fav Victorian novel is Jane Eyre. A Tale of Two Cities. Definitely. It kicks the you-know-what out of Wuthering Heights. I've got Jane Eyre and Dracula and a million other Victorian novels waiting to be read, but I can't give an opinion on them yet! I have to pick Jane Eyre, though I also have fond associations with A Study in Scarlet. I keep trying to decide if I should pick up this book, given that I have read Wilkie Collins etc. Maybe I will win it! Sounds like a really good book. For classics I would have to say Dr Jekyll and Mr Hyde. For more recently written novels I would say Jonathan Strange and Mr Norrell. One of my favourites is definitely The Woman in White by Wilkie Collins. I'm dying to read more about him in Drood! Please enter me for Drood! My favourite Victorian novels are Wuthering Heights and Great Expectations. My email is: dreamsongpoem at gmail dot com. Thanks, Aarti! My email: jeremy.appleyard at teksavvy dot com. Have always liked H.G. Wells,,thx for the contest..
Great review--I'm going to have to pick up Black Hills now. Hmmm... not a huge fan of Victorian novels--but I *do* trust Simmons to put an interesting spin on it in Drood and would love to win a copy! I enjoyed Middlemarch and The Mill on the Floss in college, but doubt I'd like them as well now. I could probably still get behind Austen's Persuasion. When it comes down to it, I probably like some of the Victorian poetry better than the novels--Housman's Shropshire Lad or Fitzgerald's "translation" of The Rubaiyat. johnsherck at yahoo dot com. Simmons is excellent at whatever he creates! Hmn....favorite Victorian novels: Hound of the Baskervilles (terrified me as a kid! )...The Time Machine...Dracula. Aarti, I'm glad you liked this book. Sudha and I are extremely excited to read it! I've been a big fan on Dan Simmons for a while, ever since I read his "Hyperion" series. I would highly recommend that series, as well as "The Terror." "Hyperion" is a science-fiction epic, and "The Terror" is a fictional account of a failed expedition to find the northwest passage. Very perceptive review, Aarti. I have not thought much about the people behind the history, and I think this book sounds very interesting to me for many reasons, including that one. I have read another book by Simmons and thought that he was a master of building suspense in his writing. I also have The Terror on my shelves, and had been thinking about buying a copy of Drood, so I definitely want to enter your giveaway for a chance to win it!! My favorite Victorian novel would have to be Great Expectations, which I just loved the stuffing out of! Thanks so much for hosting such an awesome giveaway and super awesome review! My favorite Victorian novel would probably be Tipping the Velvet by Sarah Waters. I loved it. Wow! That looks like a totally novel idea! I'd love to read this! Enjoyed your review of this book! I have to admit that after reading Drood, I didn't think I would pick up another Dan Simmons book again. I really disliked it the more I thought about it. However Black Hills sounds really good. I may have to try Simmons again after all. Count me in the giveaway. juliecookies(at)gmail.com As far as a Victorian novel that I enjoyed, does Jane Eyre count? No need to enter me since I have Drood. I wanted to say that I just adore books that enlighten me and make me think about things in a new way. Black Hills sounds like a book that does just that. Black Hills sounds really really good! It sounds a little bit like Sherman Alexie's Flight. My favorite Victorian novel is A Christmas Carol by Charles Dickens. My favorite would be Dracula. (sorry I forgot to mention my novel in the early entry. I am glad that I did not miss the contest! I have been trying to win Drood for some time, I would love to read it! Favorite Victorian novel would have to be The Agency by YS Lee - a newer book, but a fantastic one.